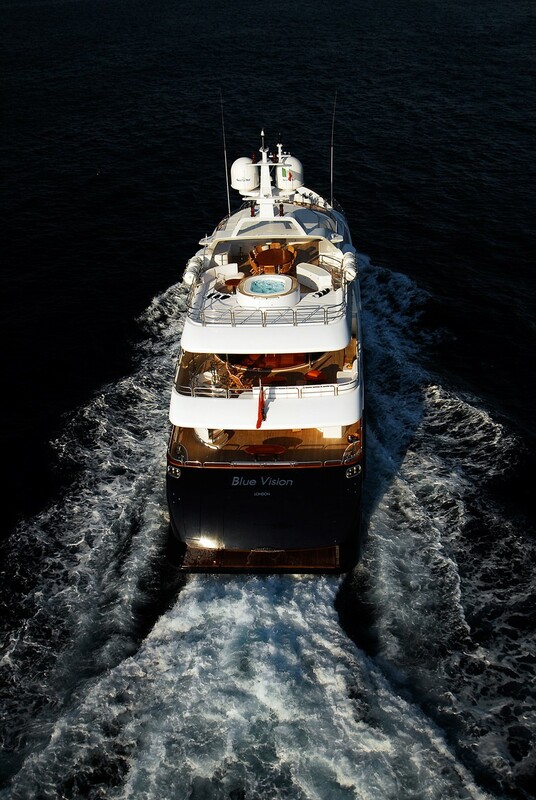 M/Y BLUE VISION is a 2007 43m (143') luxury motor yacht, built by Benetti Yachts with a comprehensive refit done in 2017. 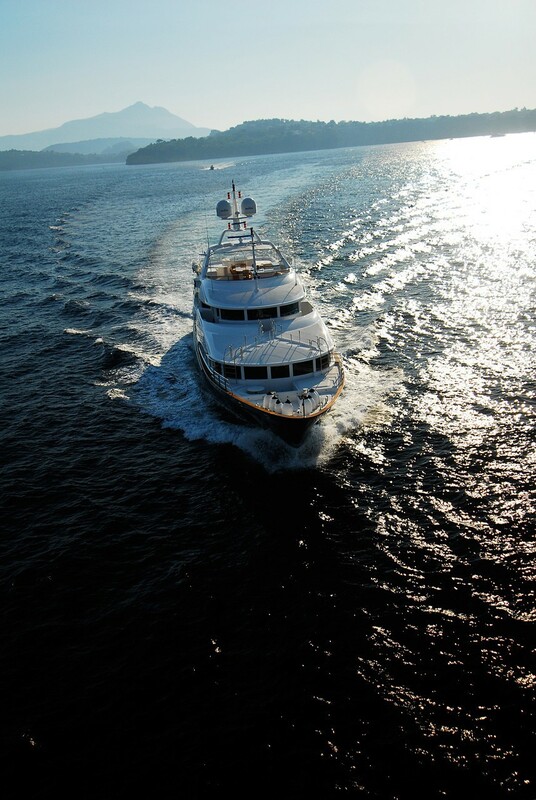 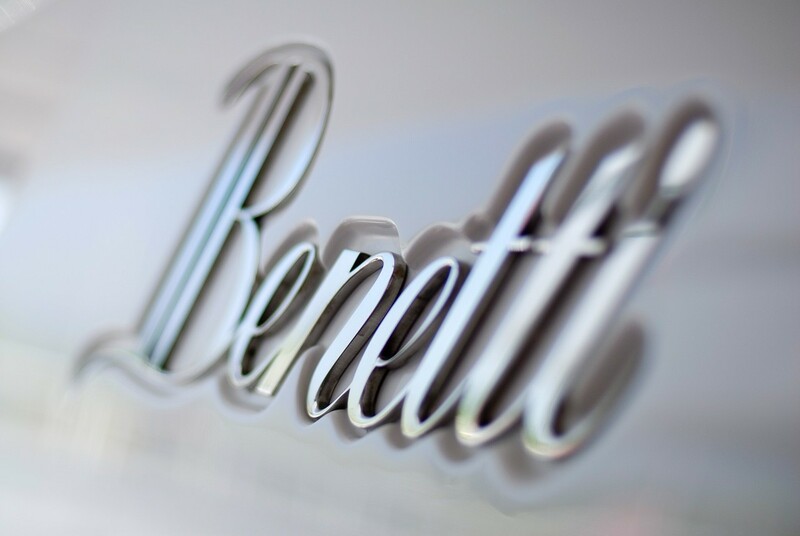 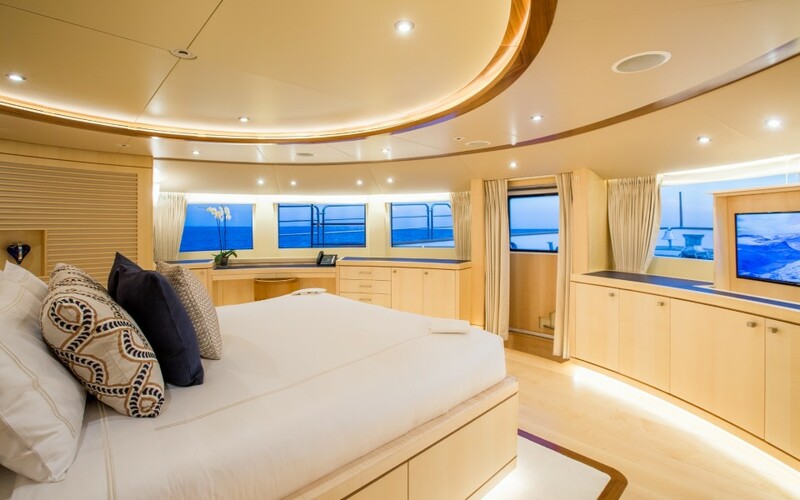 She was constructed by a very experienced luxury yacht builder and her design and quality display this experience throughout. 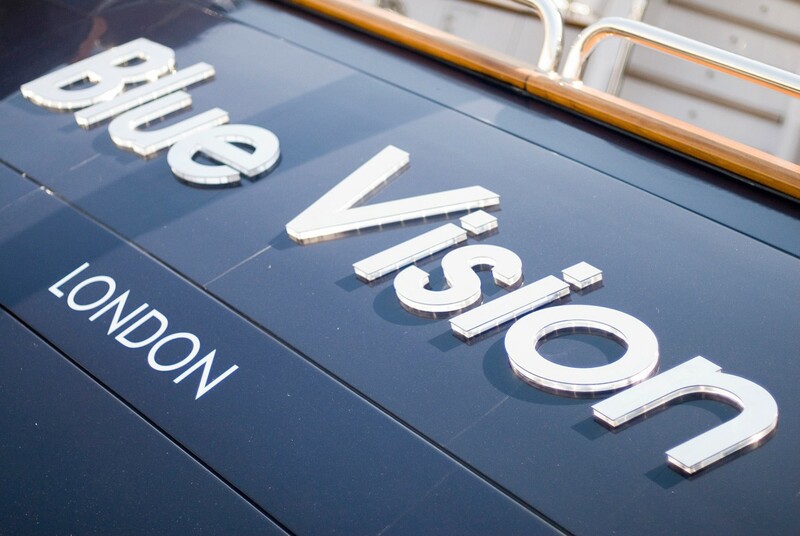 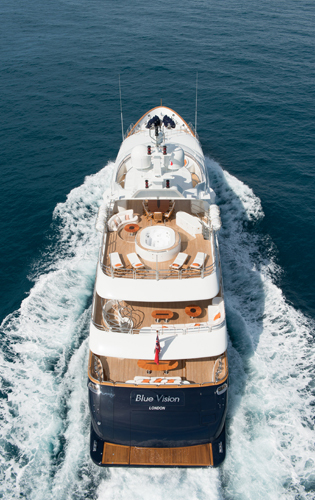 Large and spacious for a 43-metre, Blue Vision also provides a rich list of features and benefits seldom found on a luxury yacht of this size. 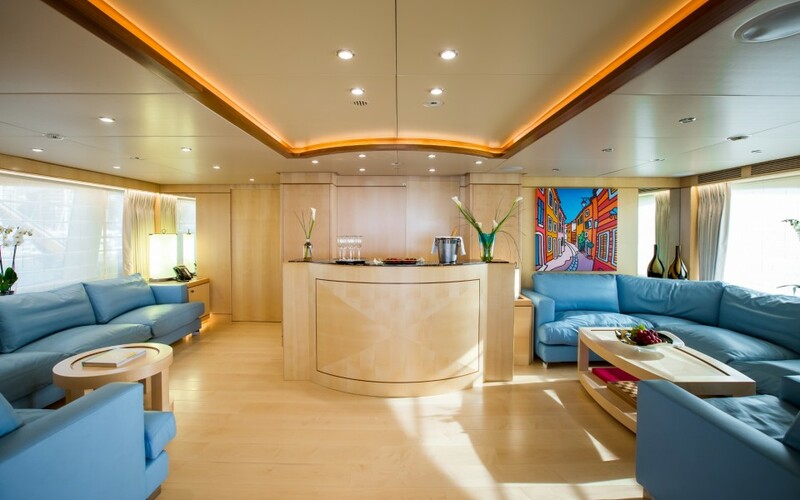 Her five-cabin layout offers accommodation for up to twelve charter guests, serviced by a highly professional crew of nine. 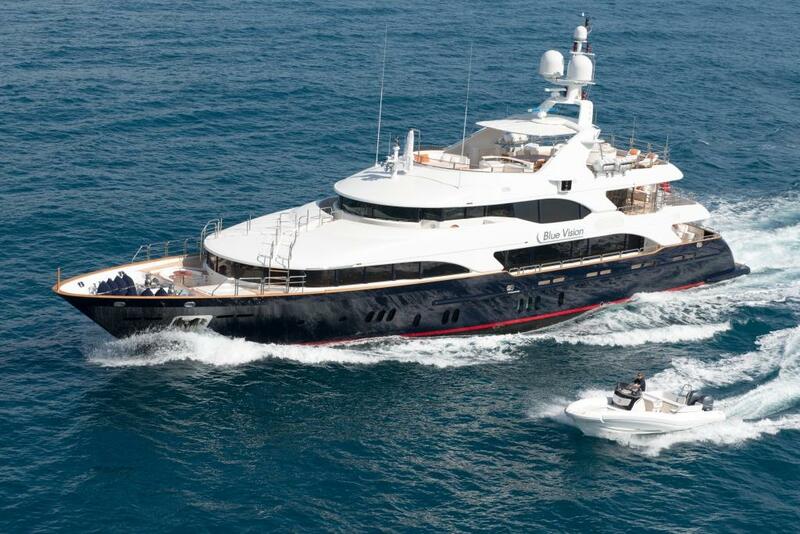 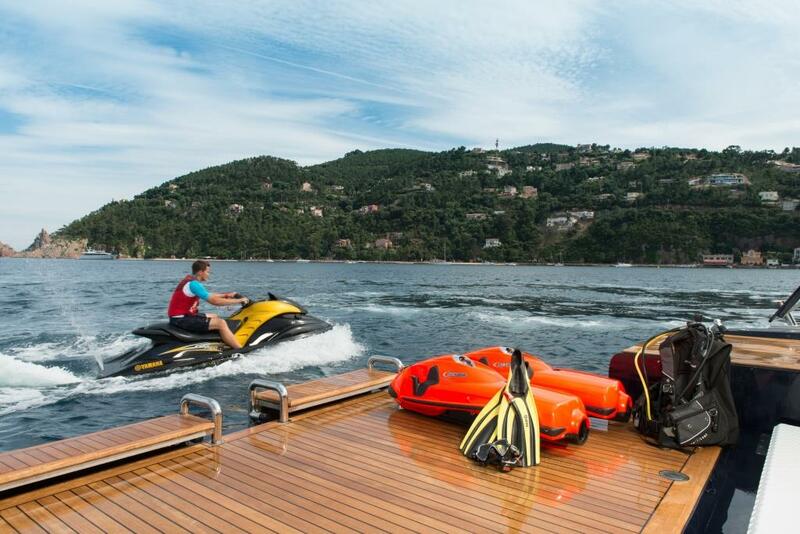 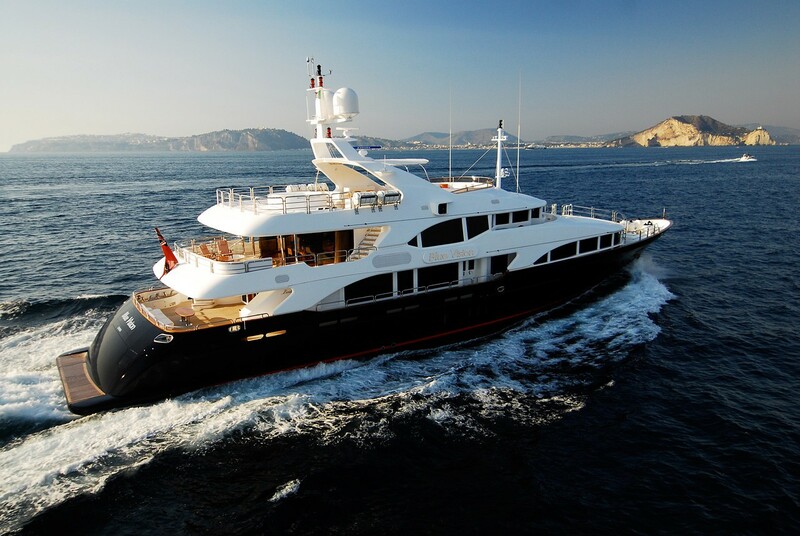 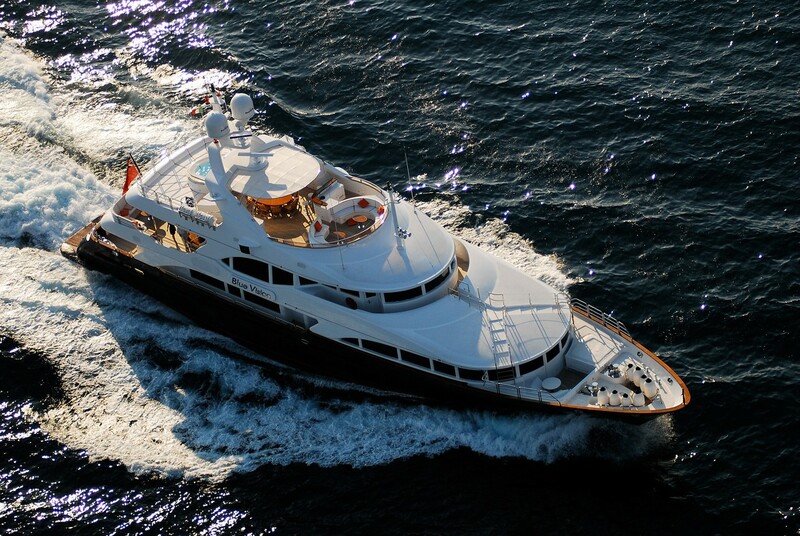 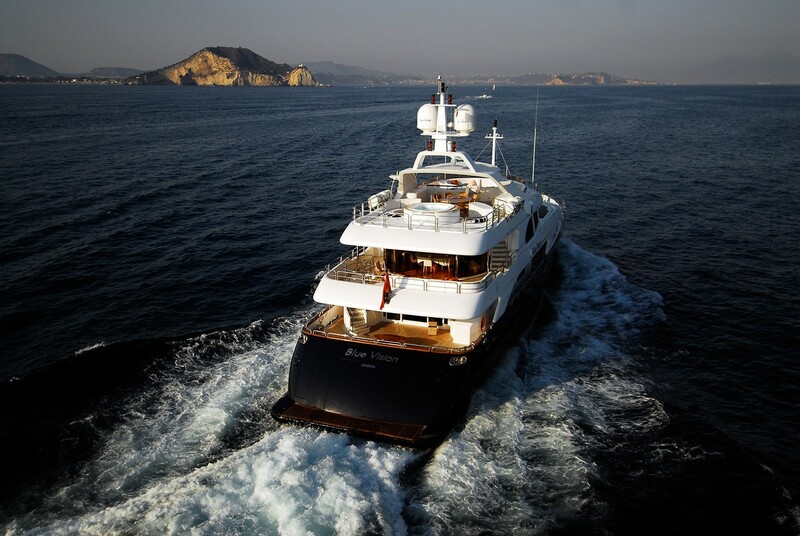 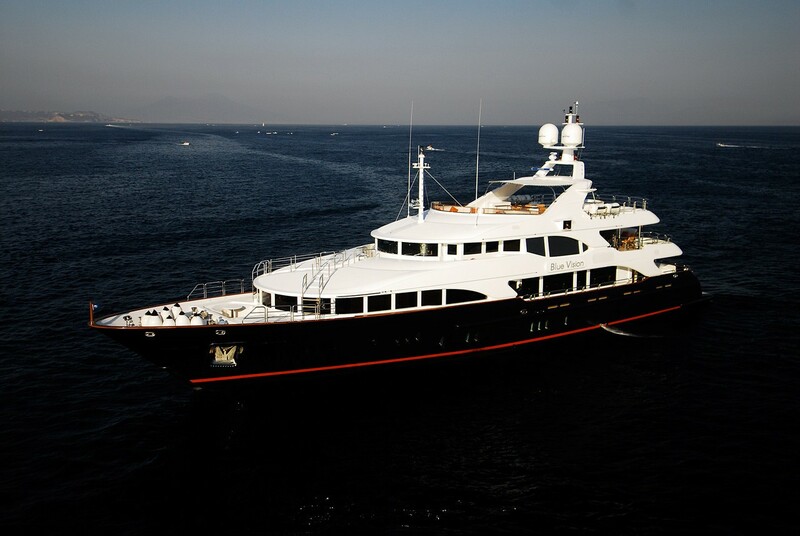 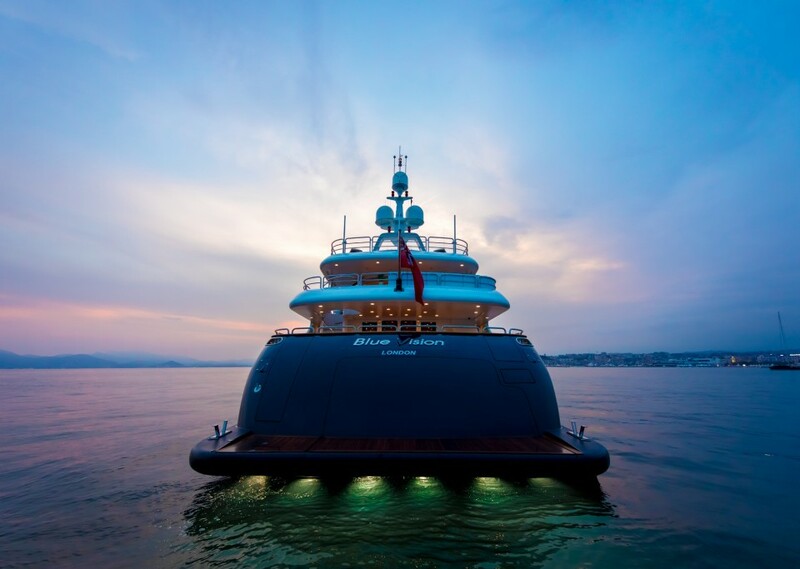 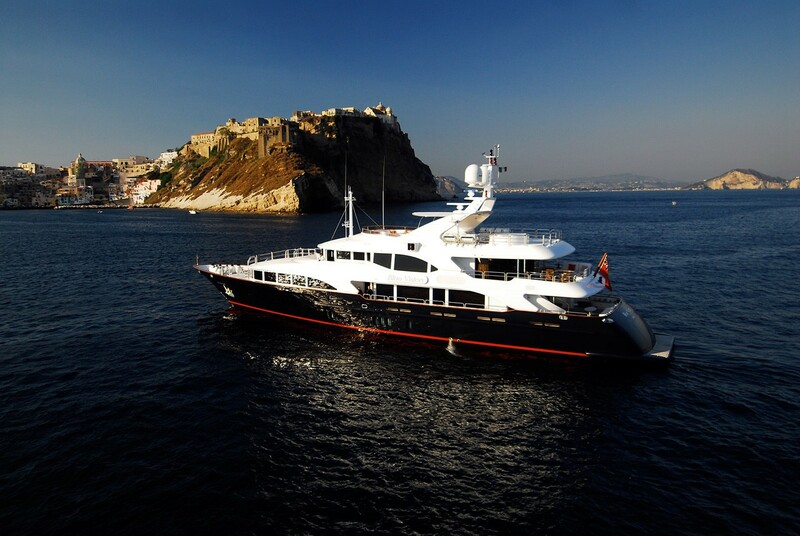 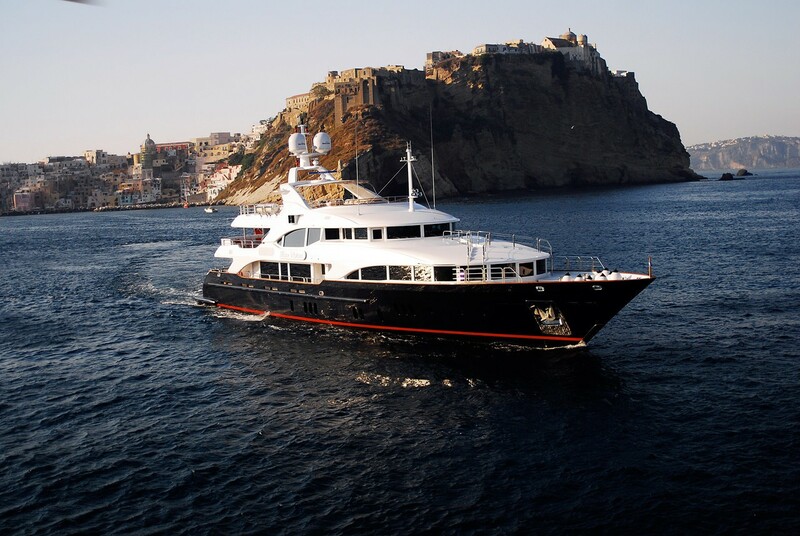 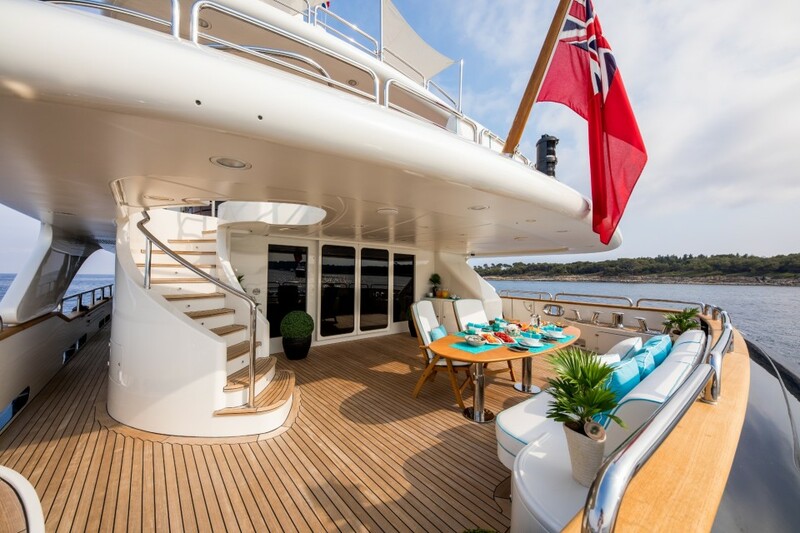 The yacht underwent a number of refits, including one in 2009/2010 and 2017. 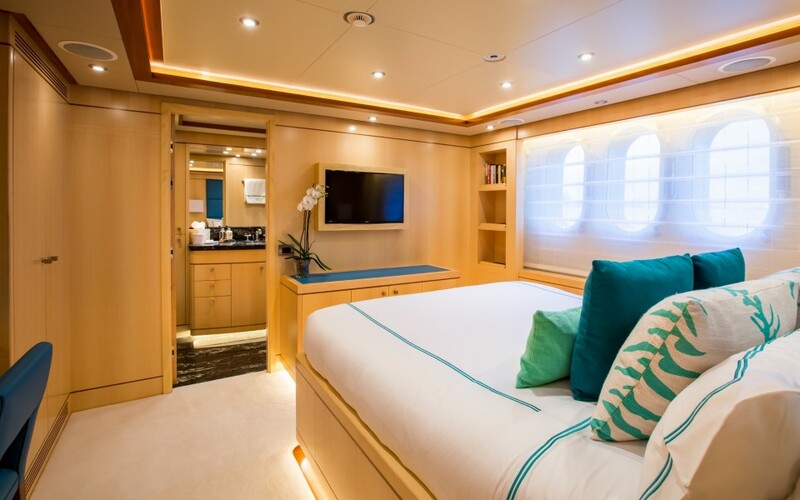 In 2016/2017, she had an 18-month full interior refit (approximately 7 million Euros spent) which included all new electronics in the bridge and all new exterior soft furnishings. 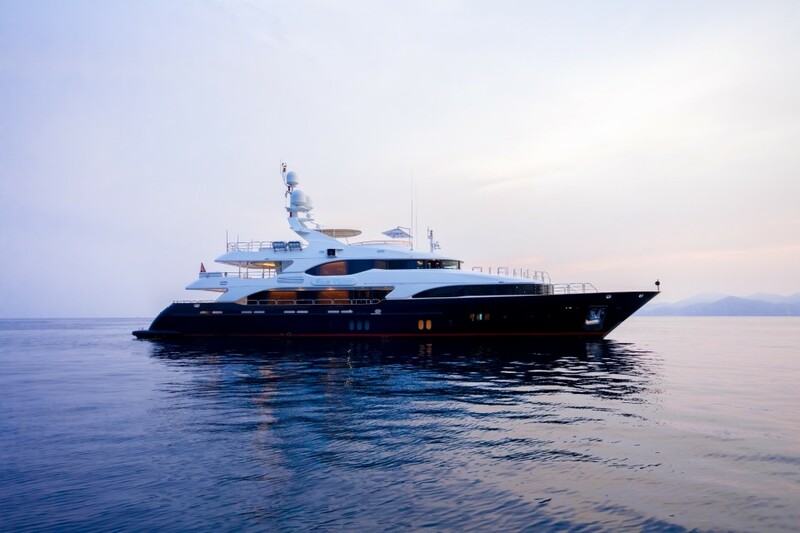 The extensive refit and renewal in 2010 included an installation of Naiad zero-speed (at anchor) stabilizers, under-water lights and a shower put on her transom and swimming platform. 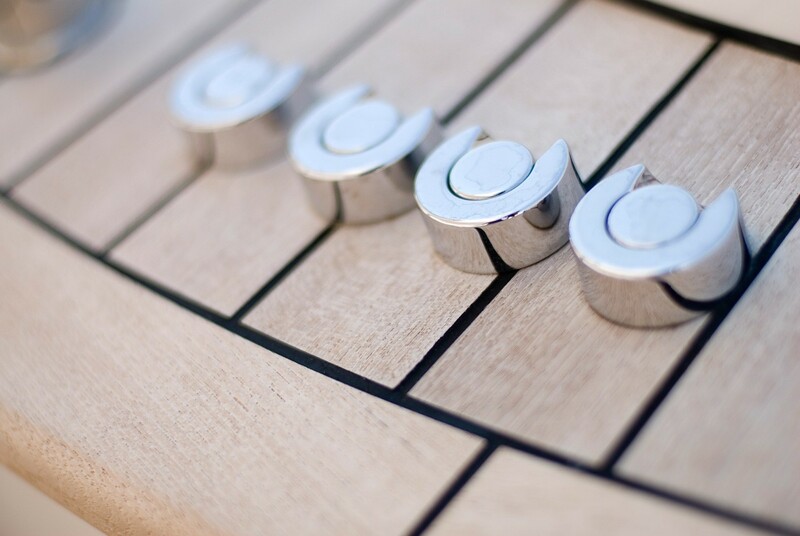 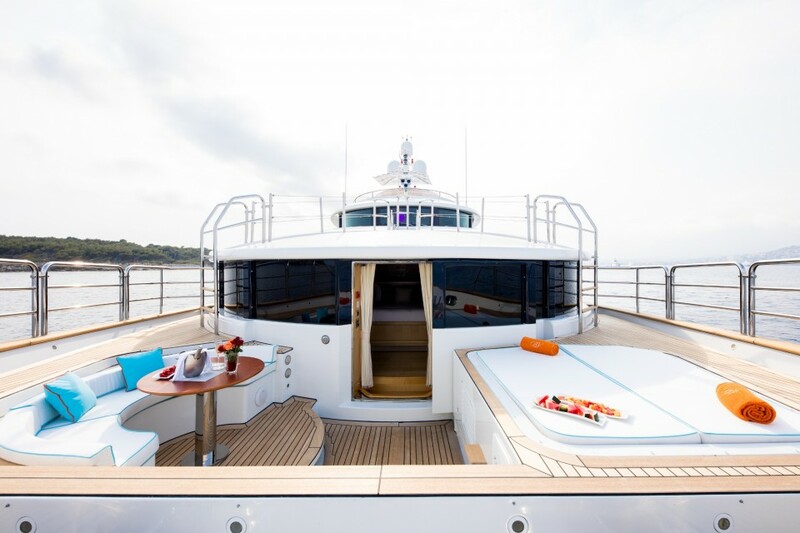 Also, a new aft deck table, new teak decking surrounding the spa pool on her sun deck. 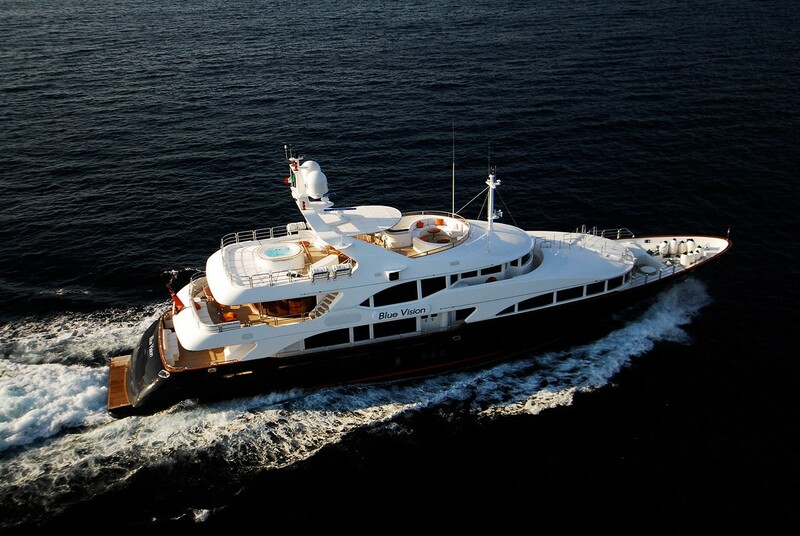 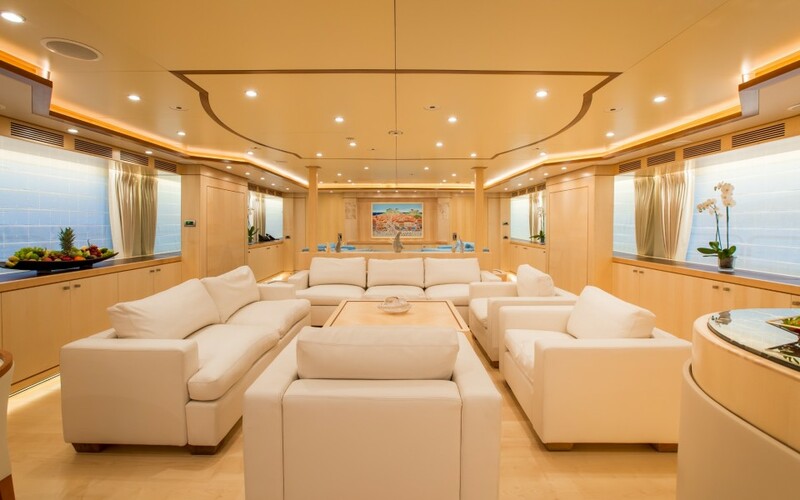 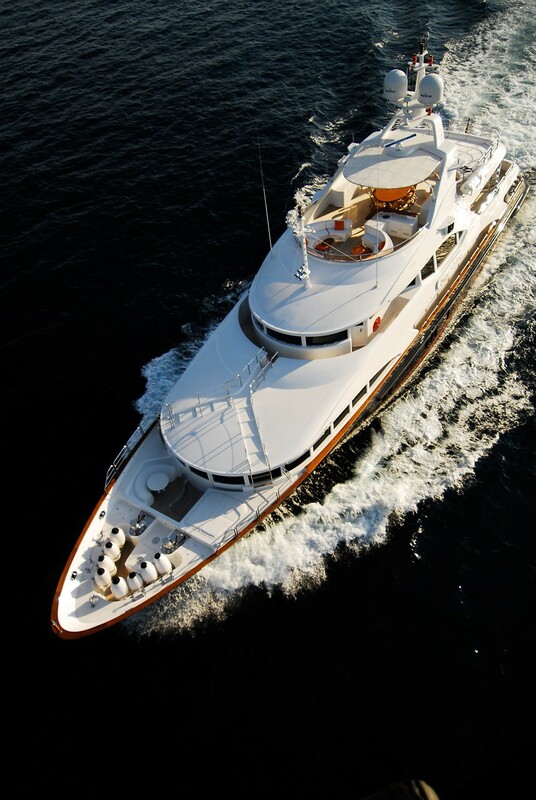 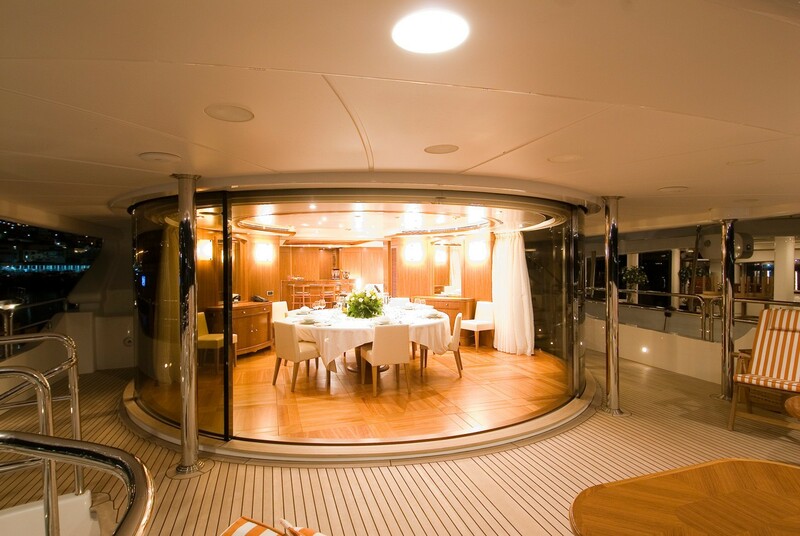 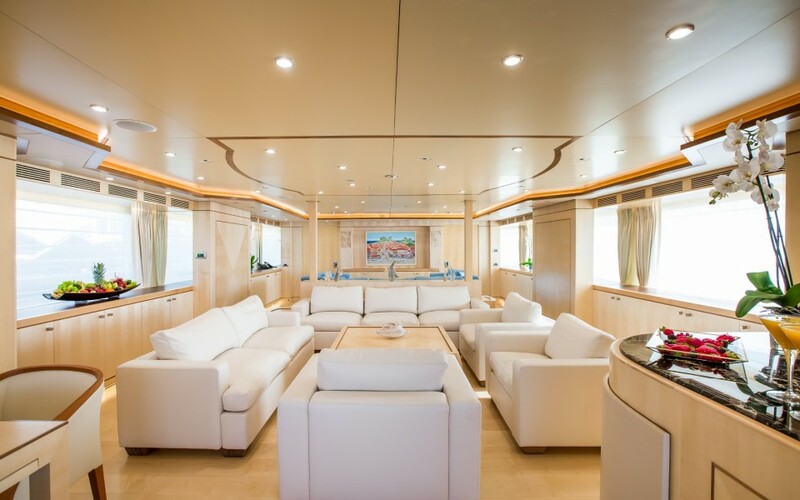 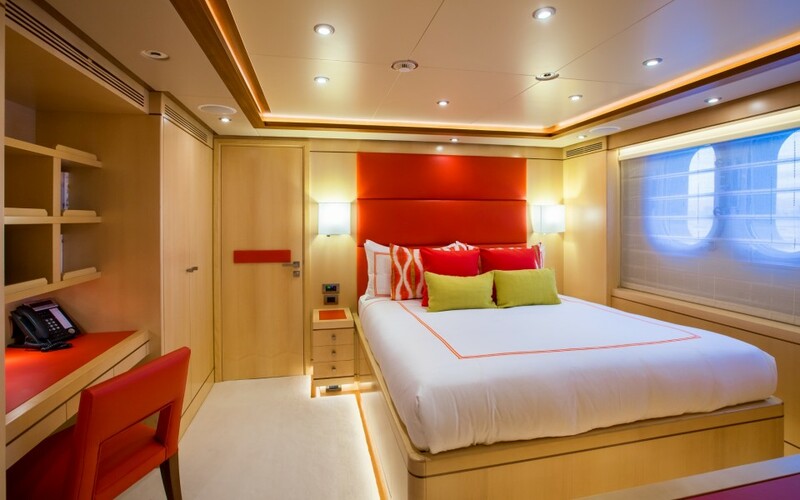 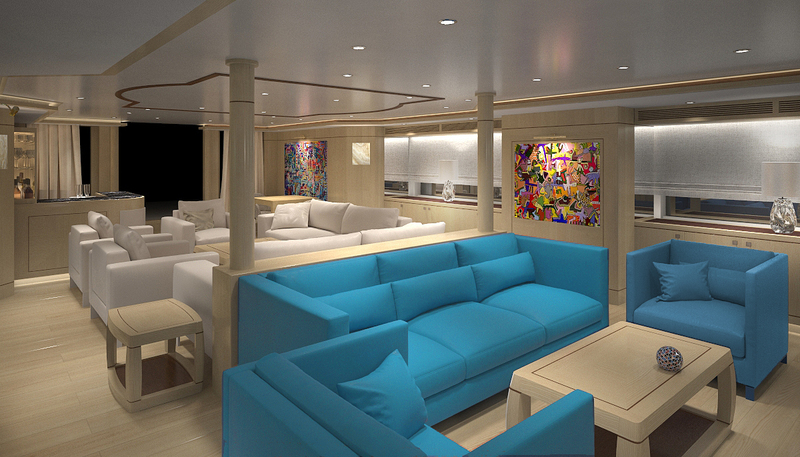 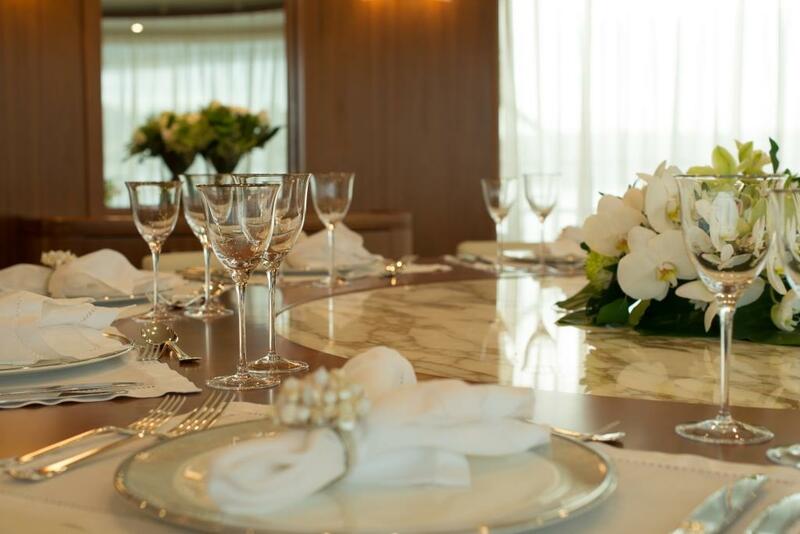 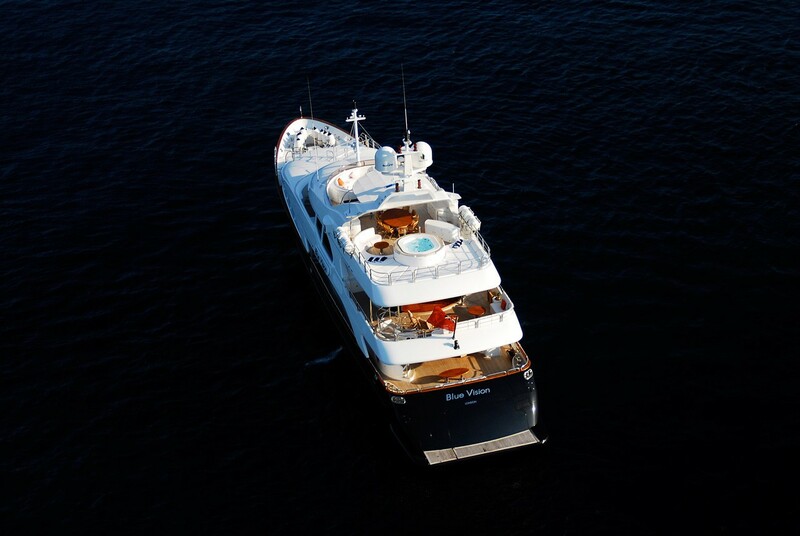 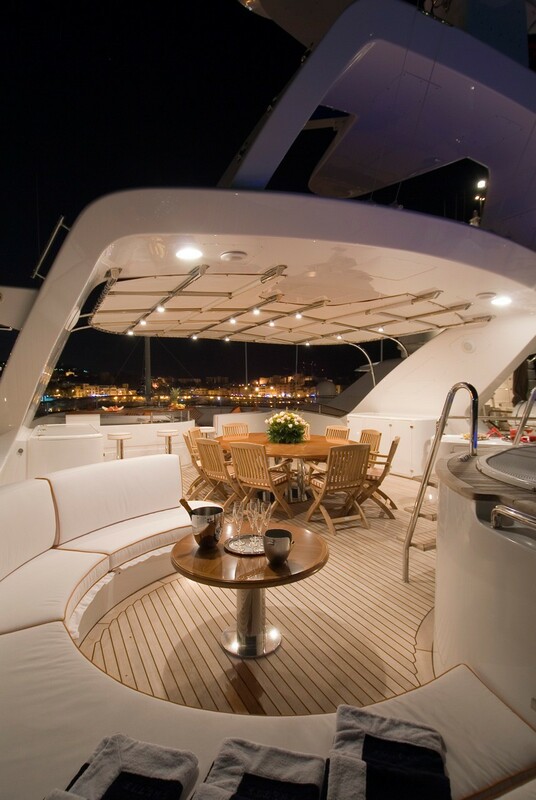 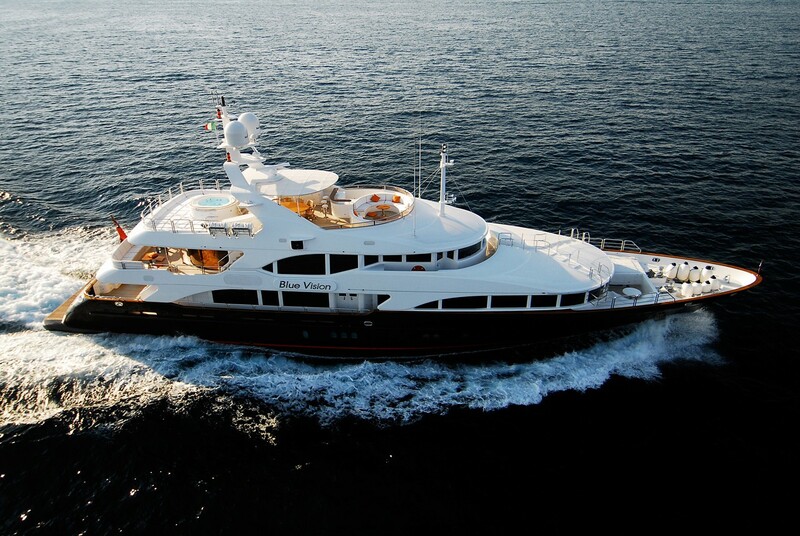 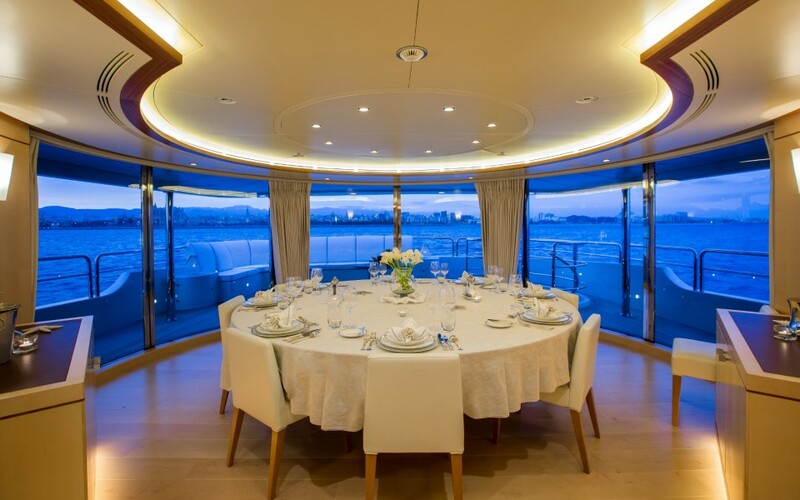 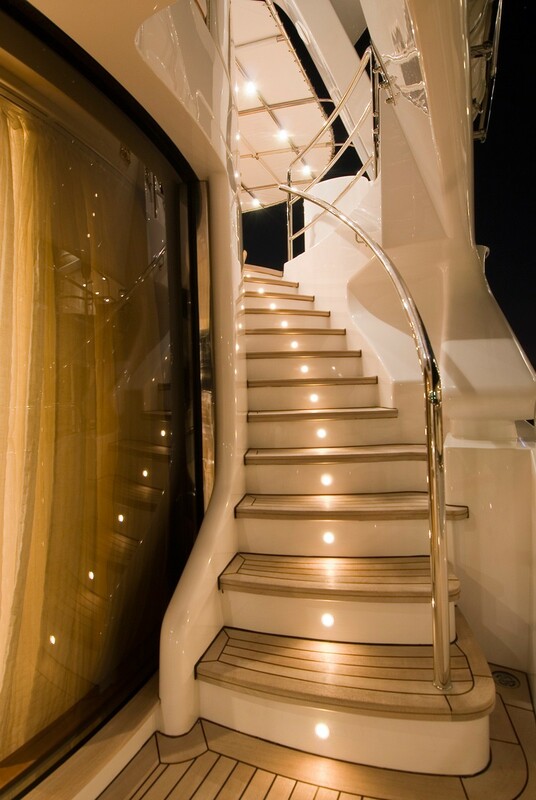 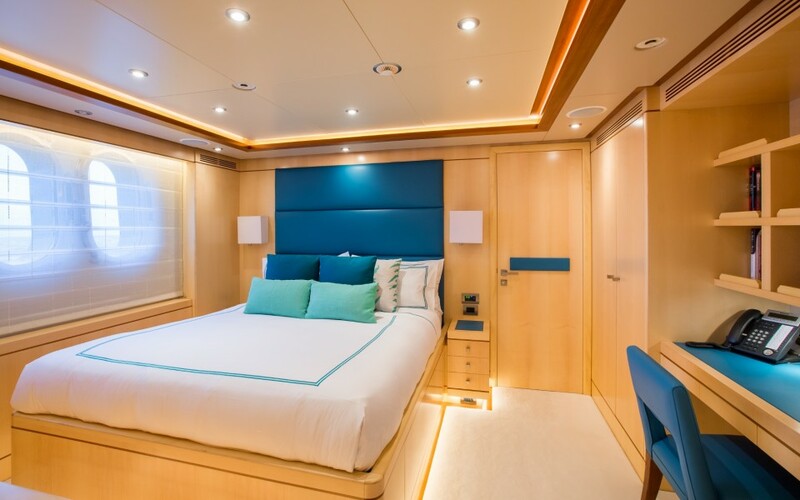 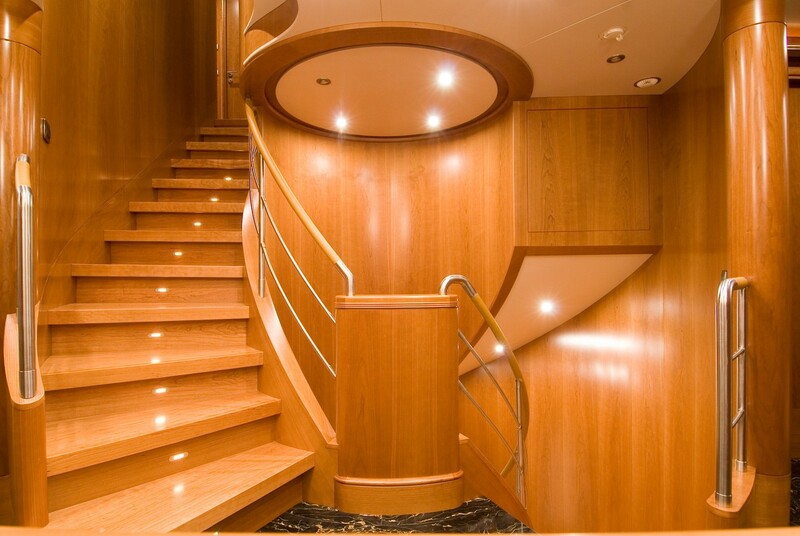 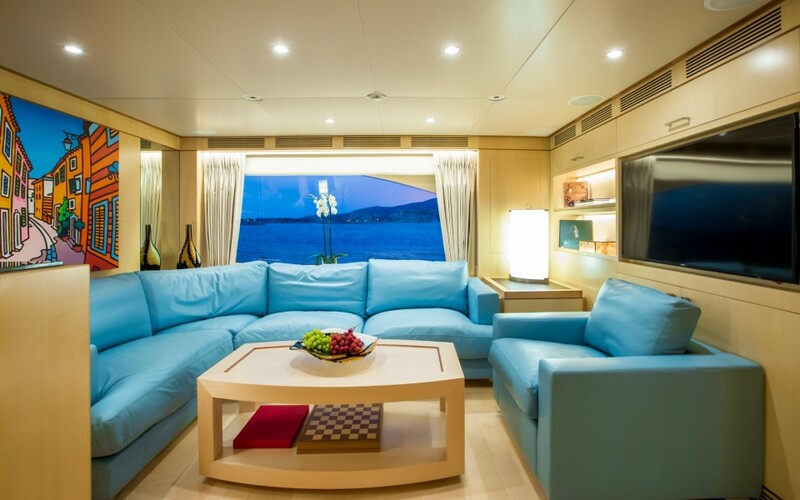 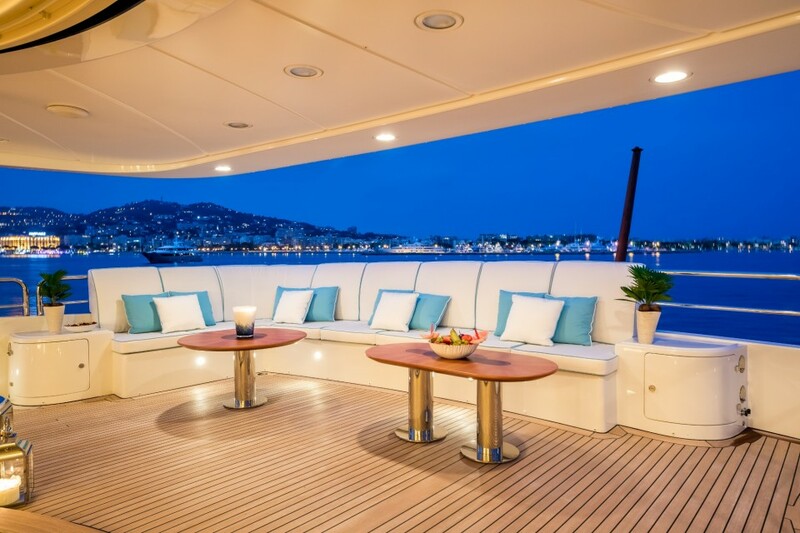 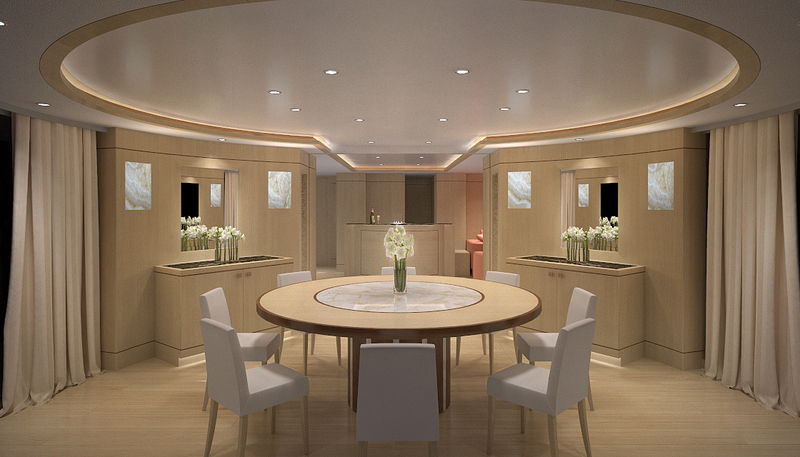 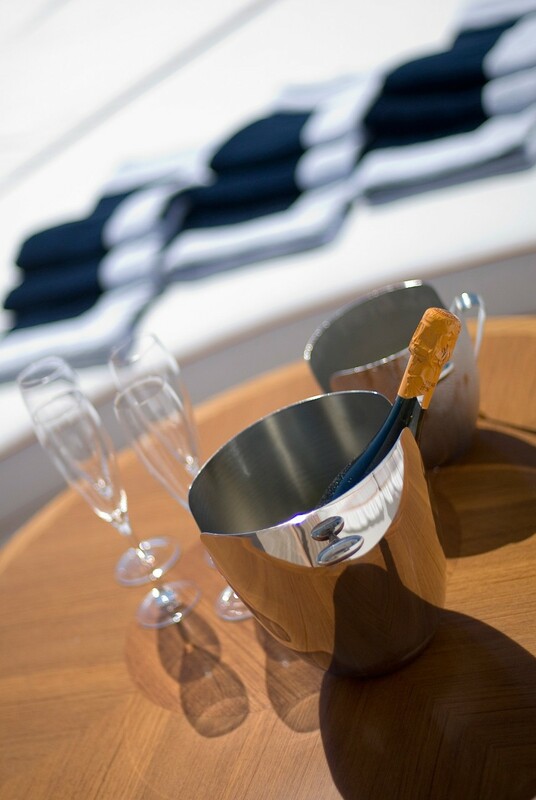 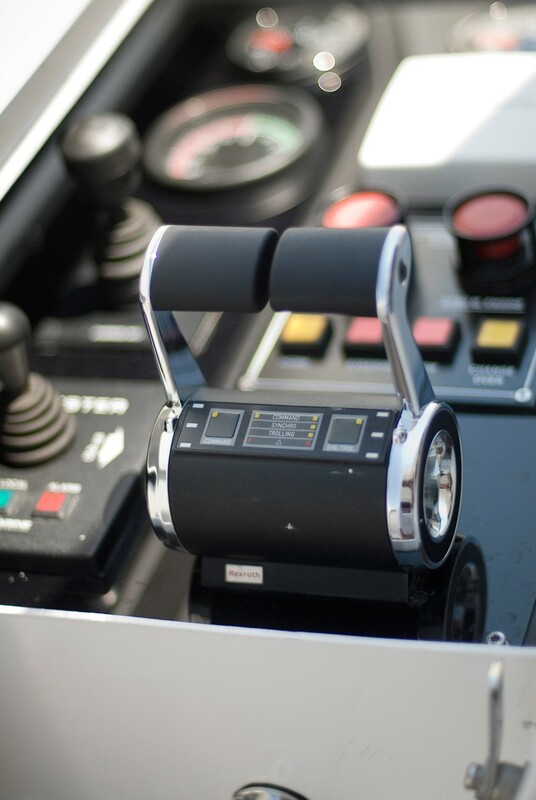 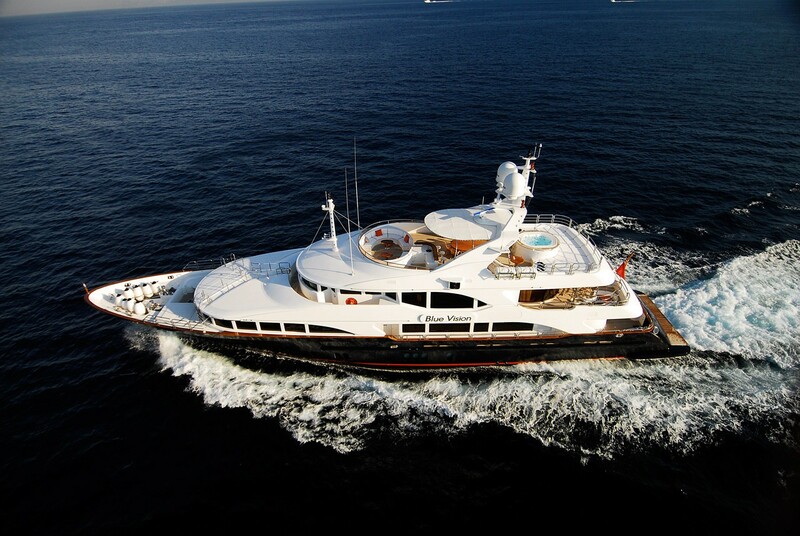 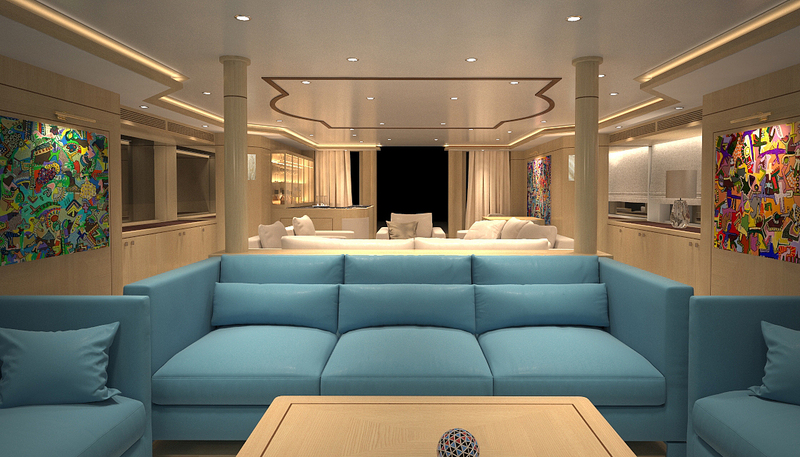 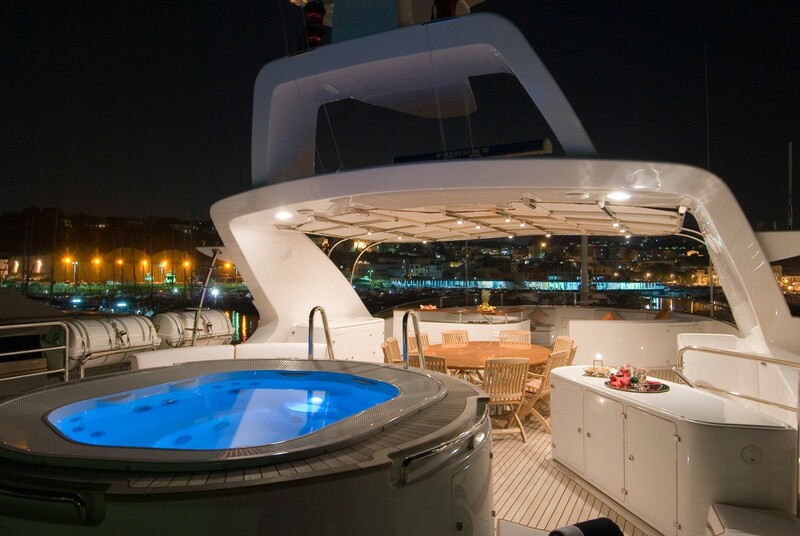 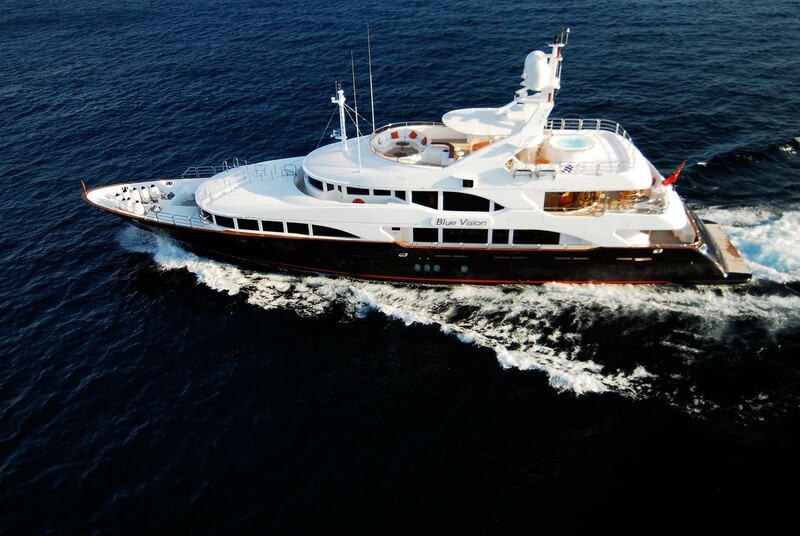 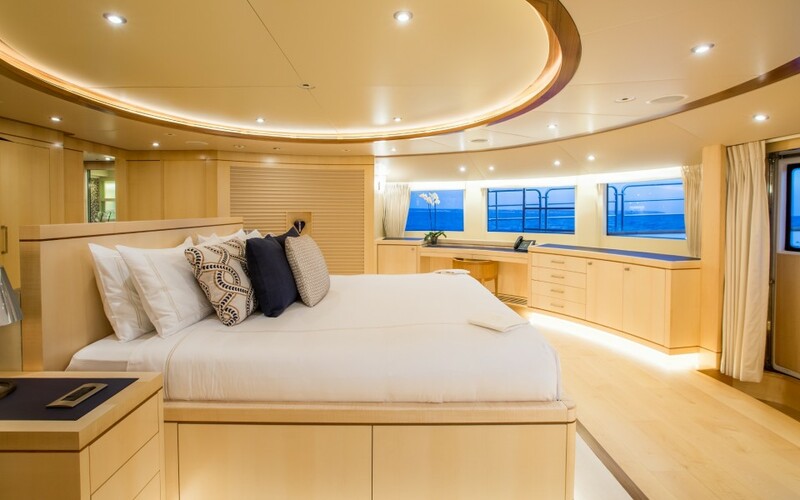 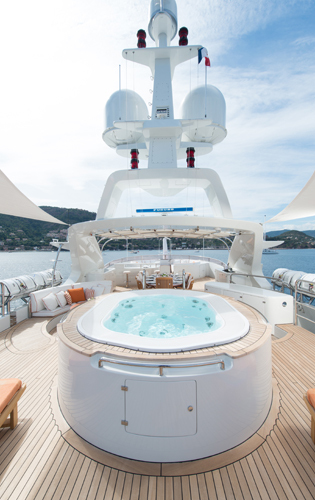 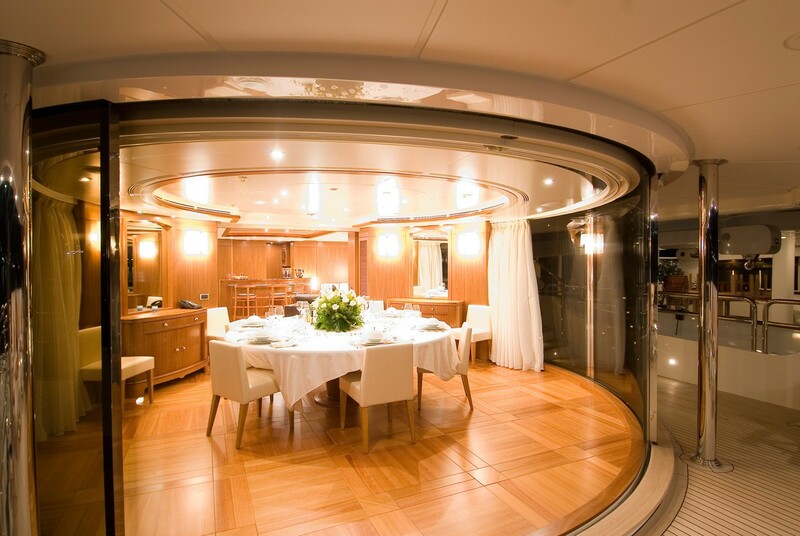 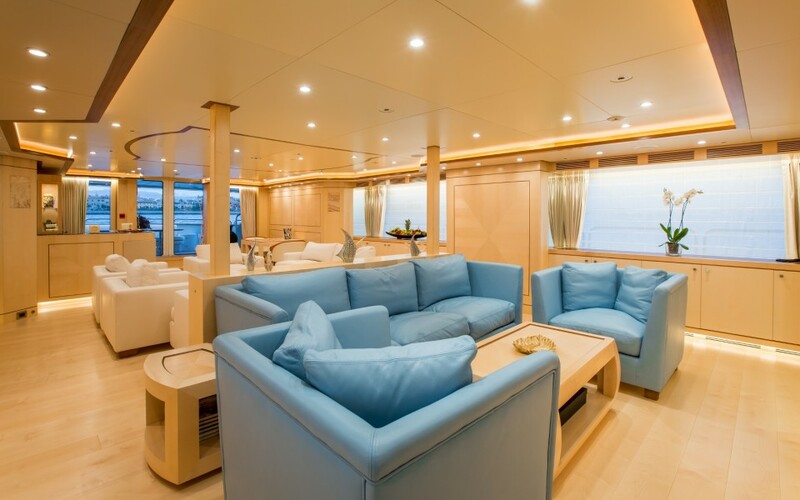 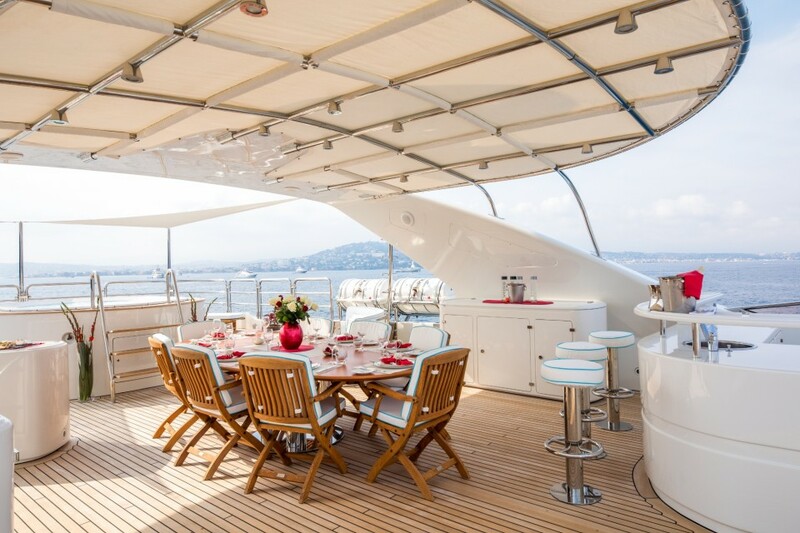 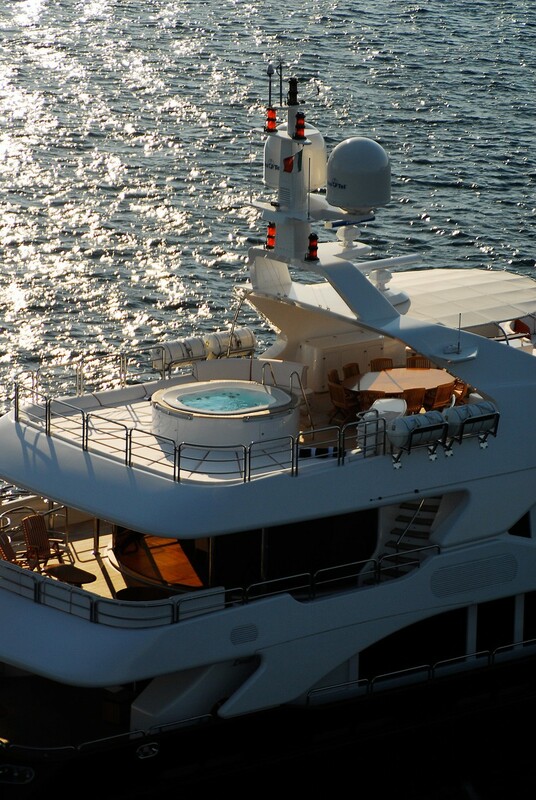 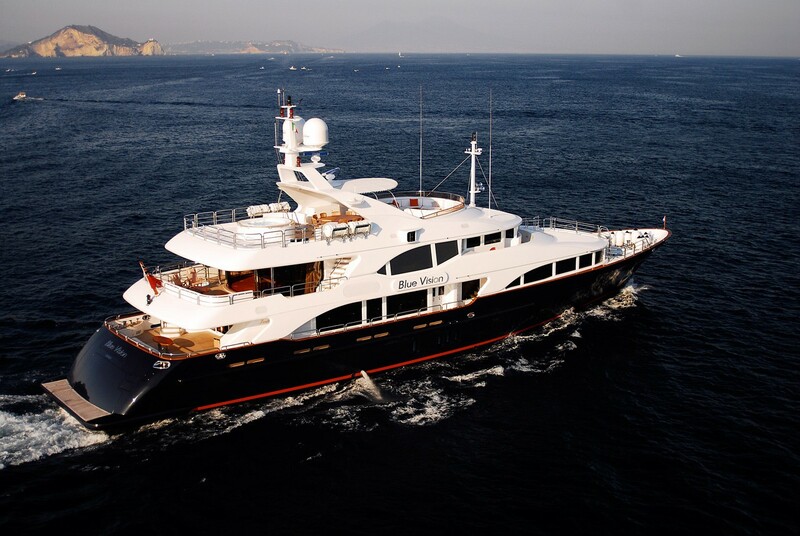 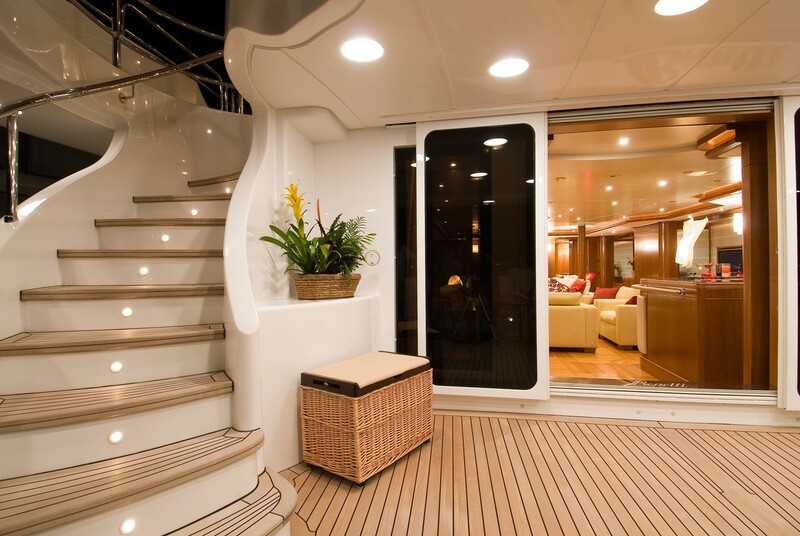 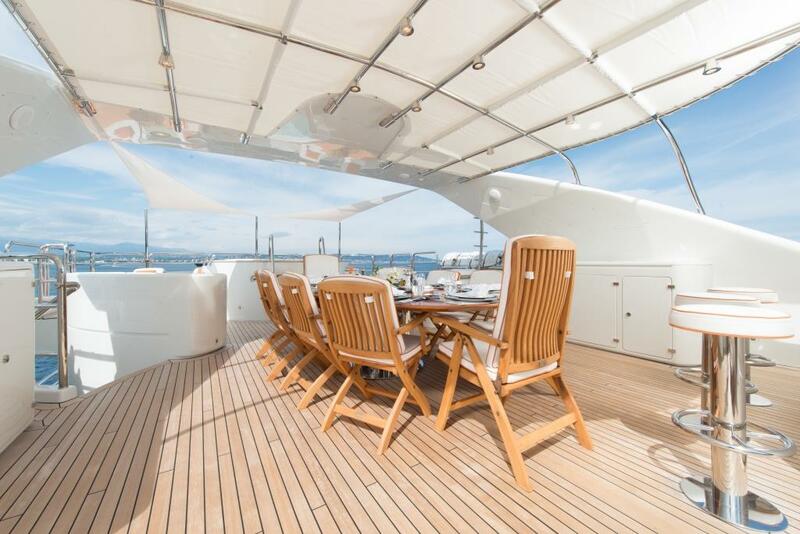 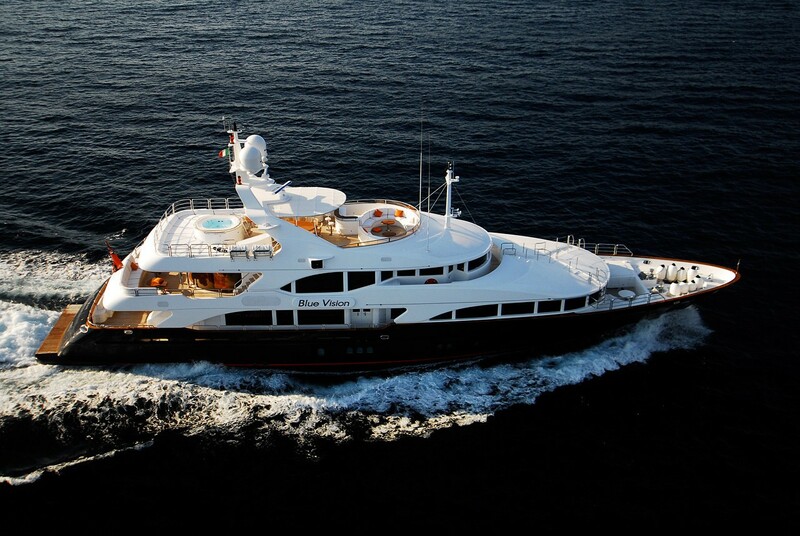 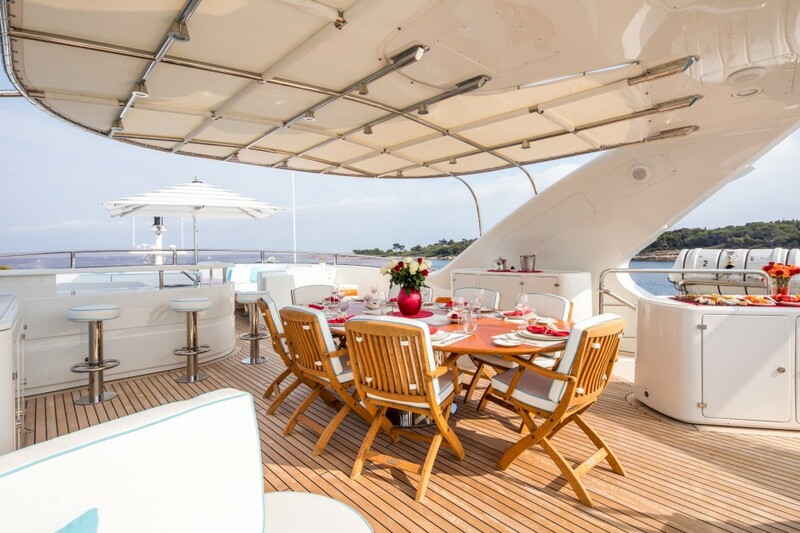 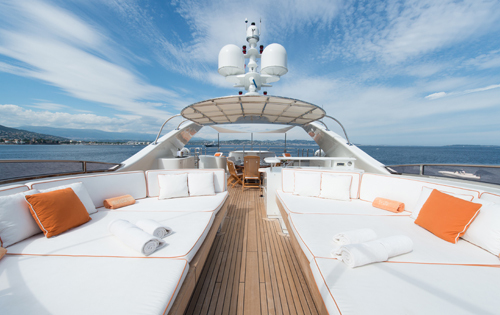 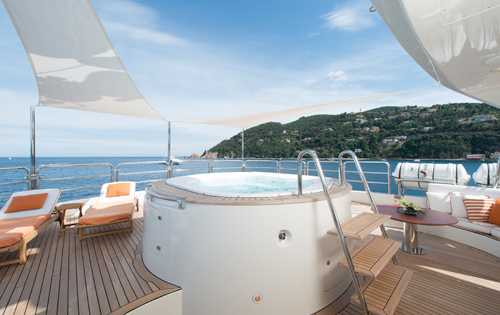 The main master cabin is situated forward on the yacht’s main deck. 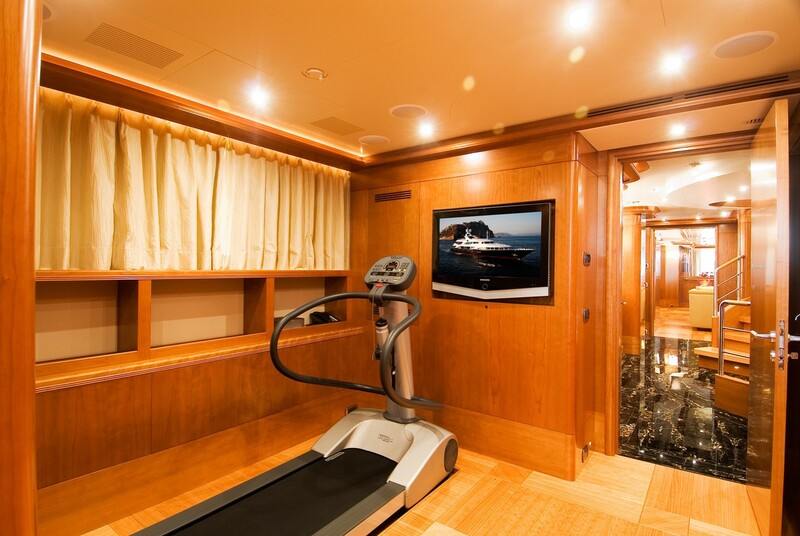 It features a VIP entrance with a treadmill and TV as well as his & hers bathroom, tub and shower as well as a dressing room. 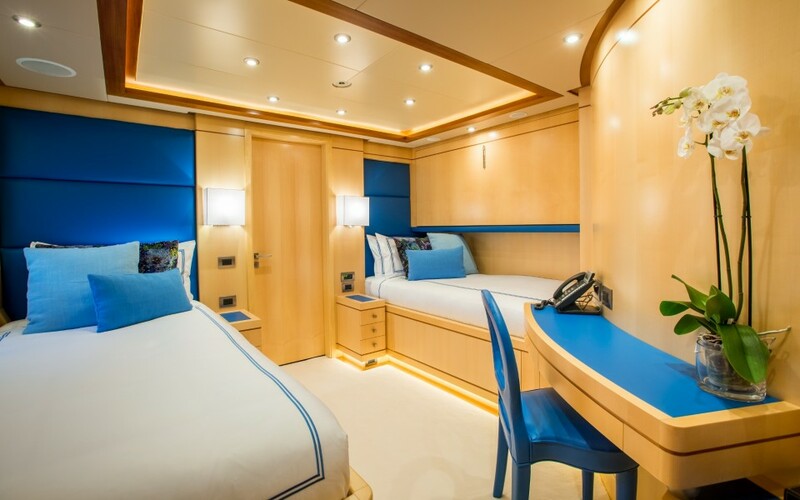 There are four additional cabins on the lower deck including two doubles, with Pullman bunks, and two twin cabins. 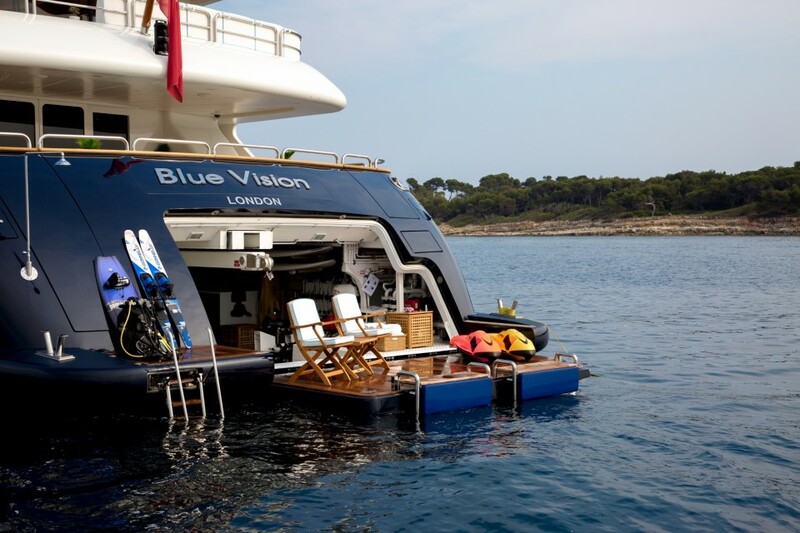 BLUE VISION’s generous sundeck offers a Spa Pool, sun beds, and a fantastic area for alfresco dining for ten charter guests. 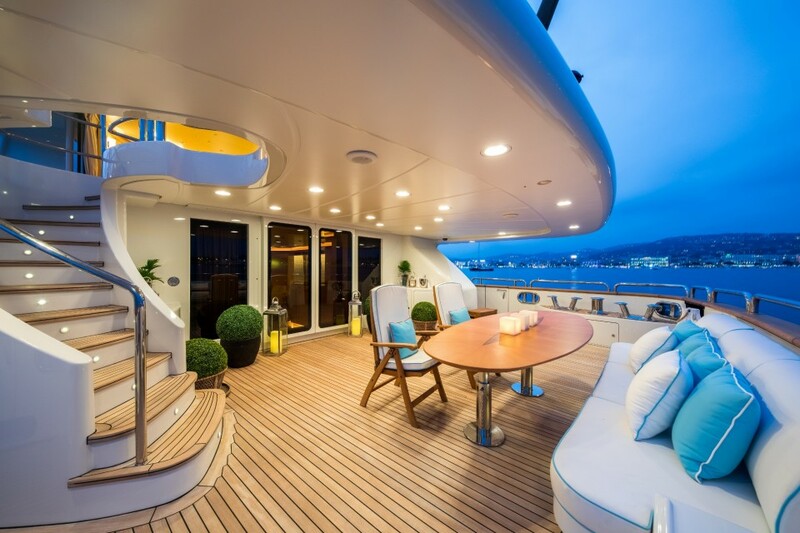 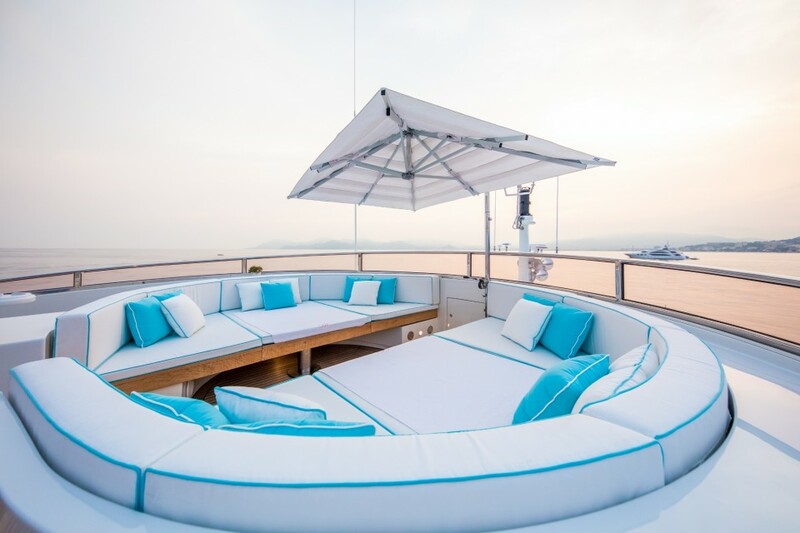 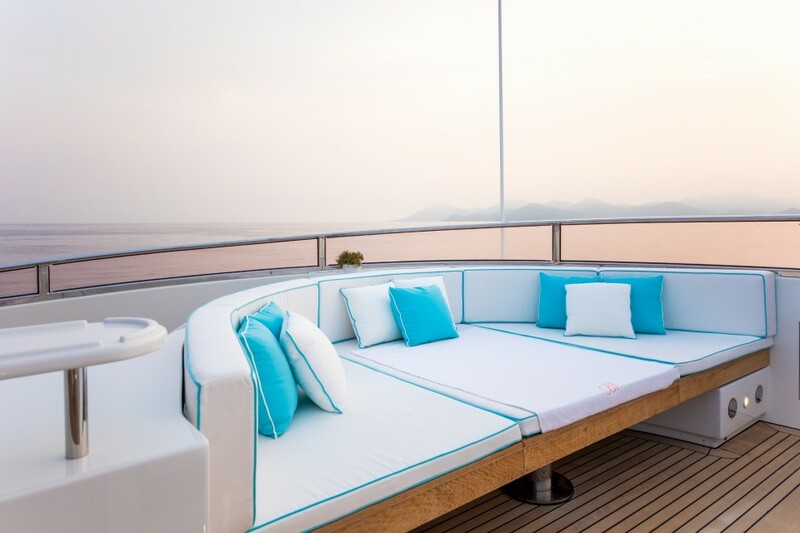 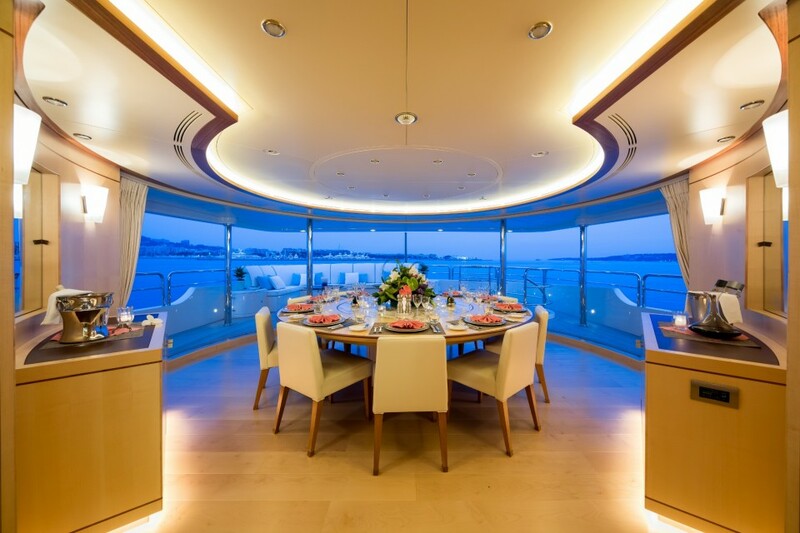 The yacht’s Upper deck features a lounge area aft, a dining area with sliding windows to the deck, a Sky lounge with a bar and seating areas as well as the bridge. 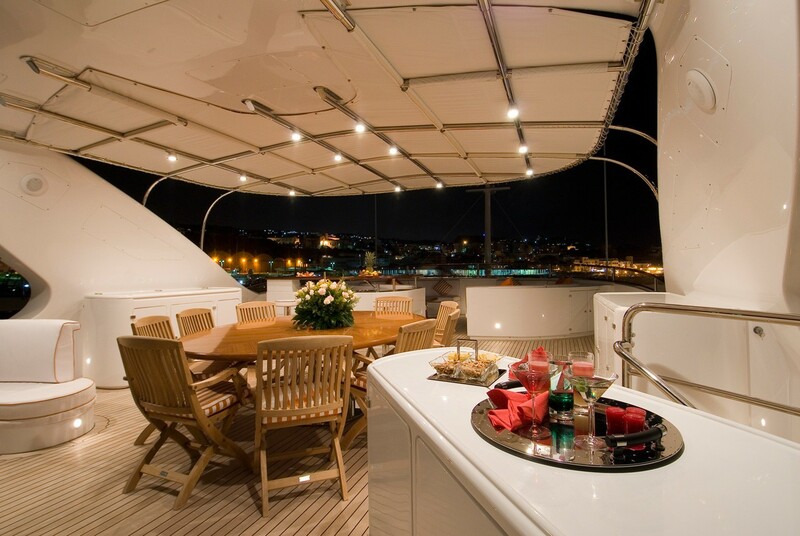 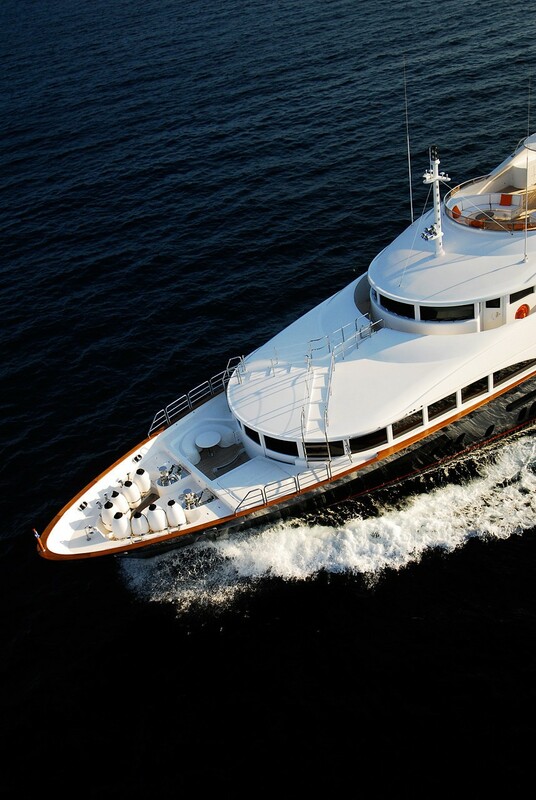 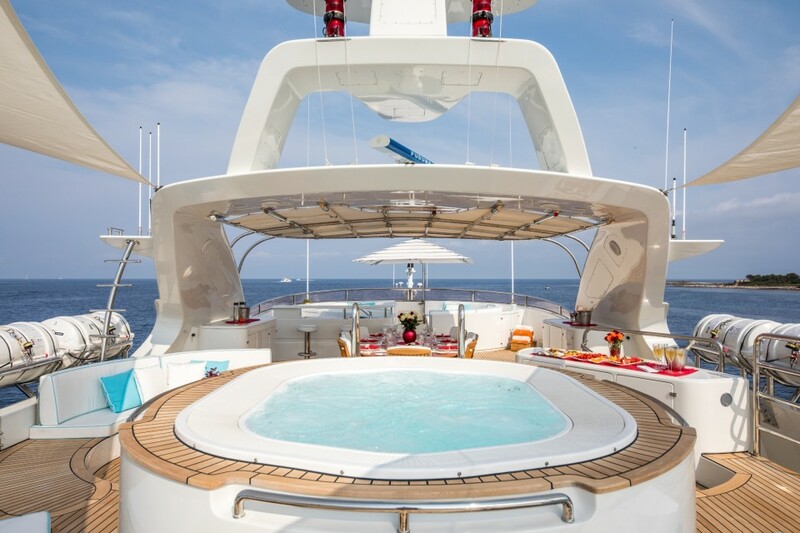 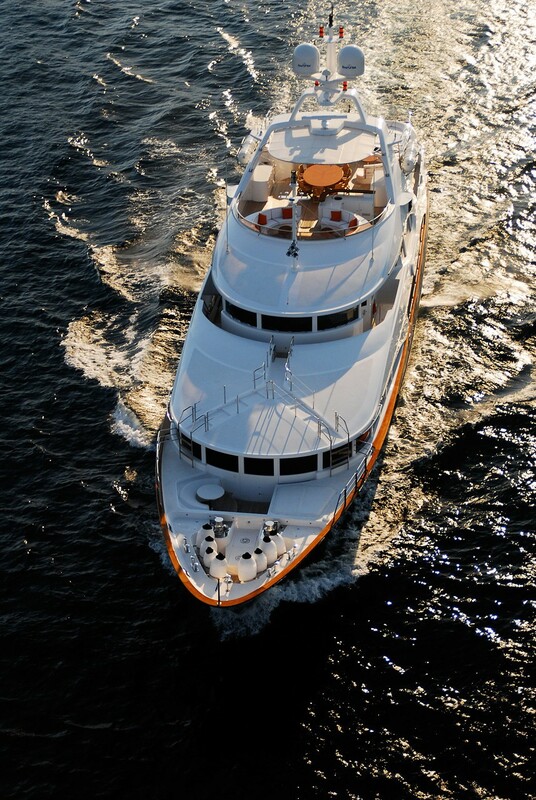 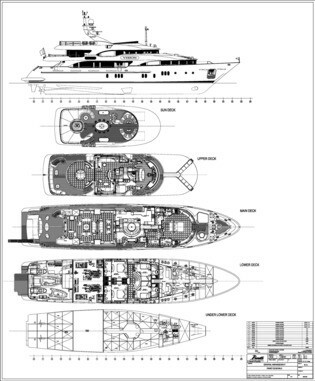 There are an ample deck space and areas for sunning as well as a sunning and seating area forward on the bow. 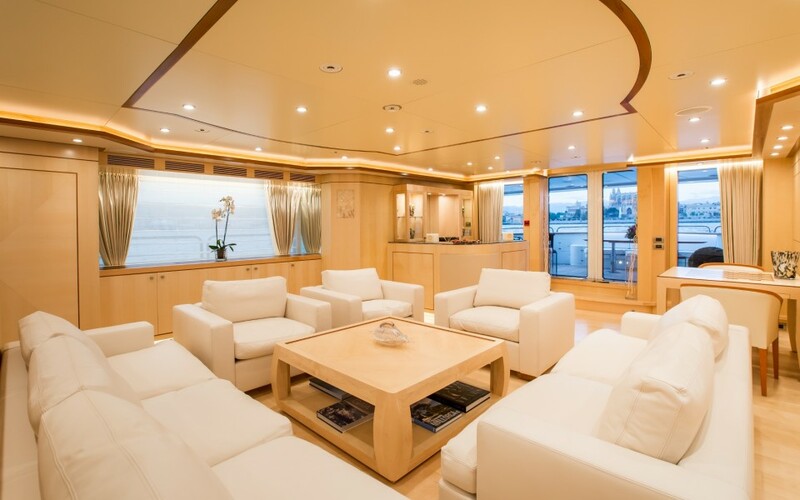 The main deck holds the main saloon with two lounge areas and two plasma screens, a bar, main foyer with stairs and powder room and an owner's study with the master cabin. 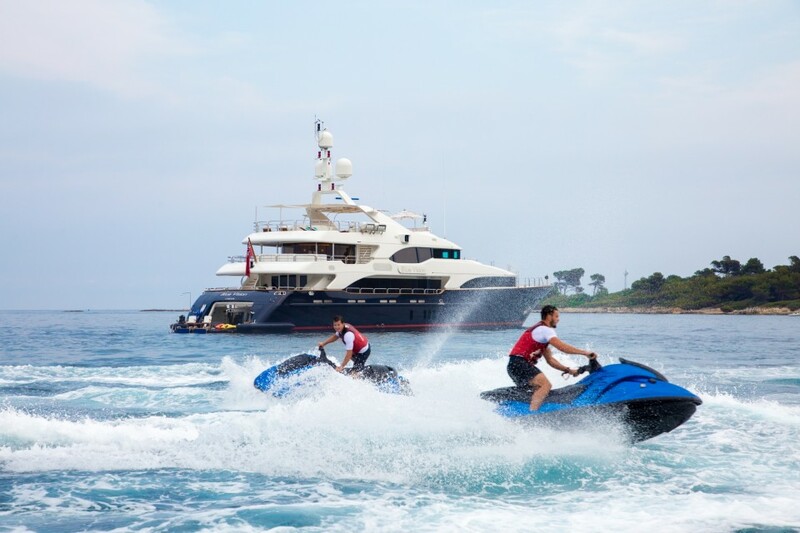 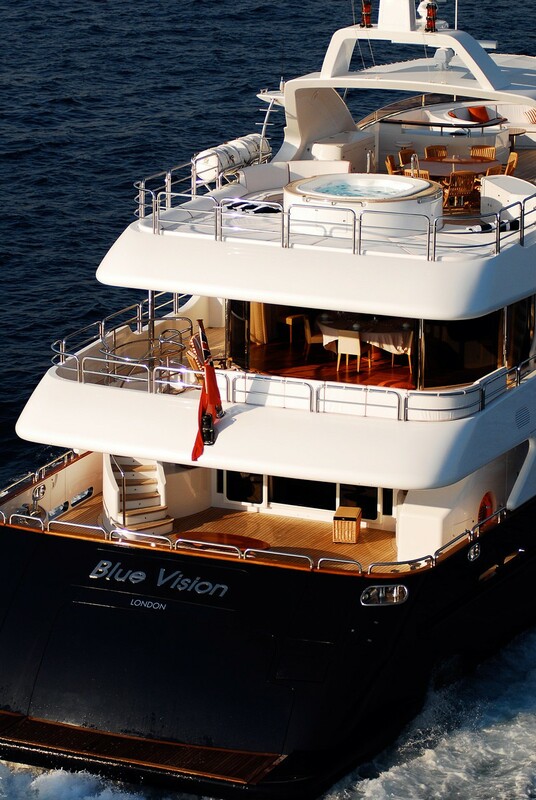 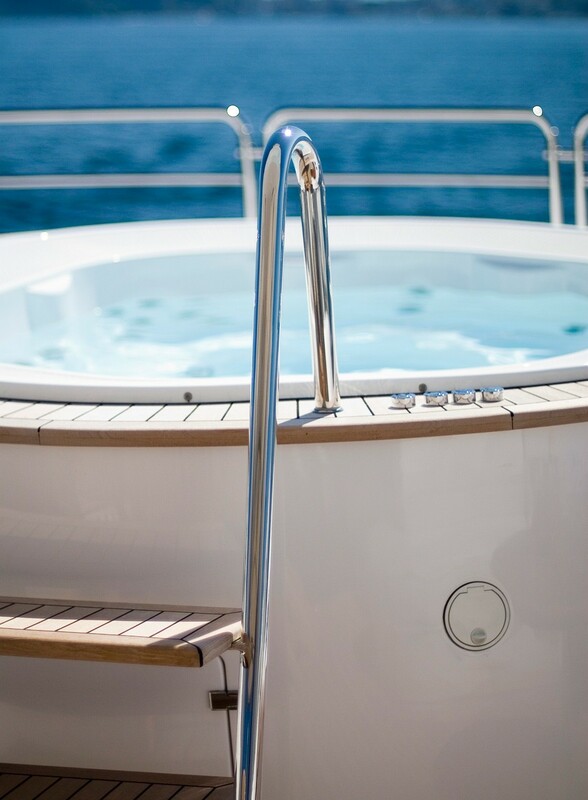 Yacht Blue Vision offers accommodation for up to twelve charter guests accommodated in five deluxe suites cabins in the following format: A Master Stateroom on her Main deck and a VIP cabin with a treadmill and TV, his & her bathroom with tub and dressing room. 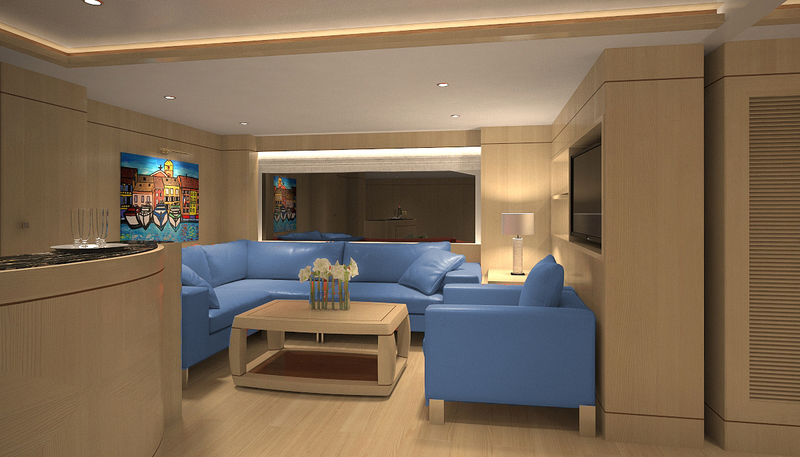 In addition, there are two double cabins with Pullman bunks on the lower deck and two twin cabins. 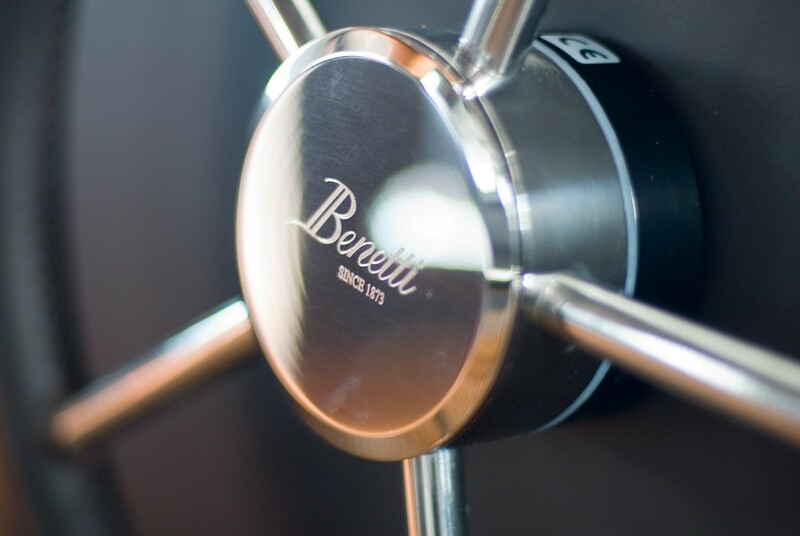 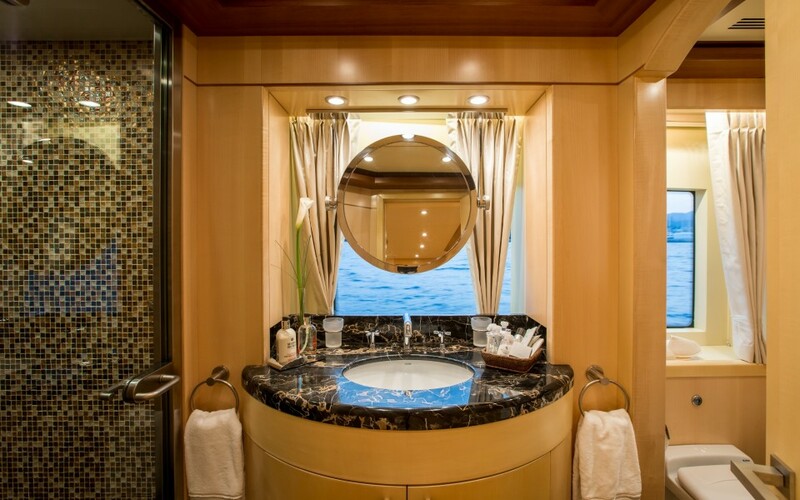 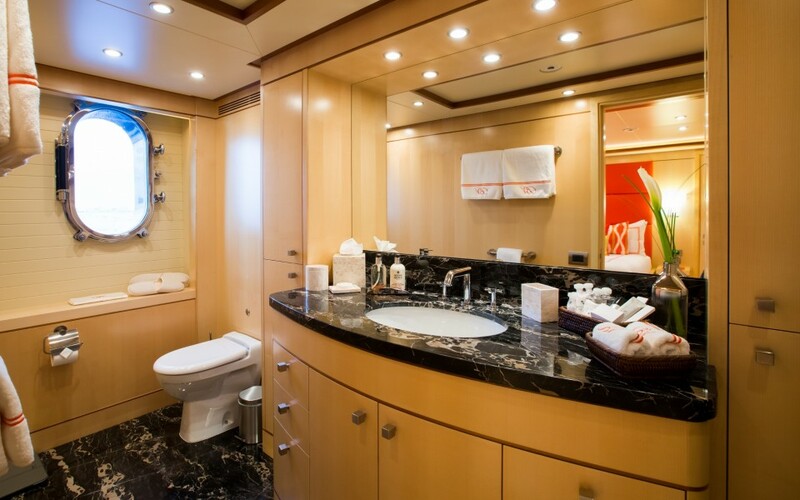 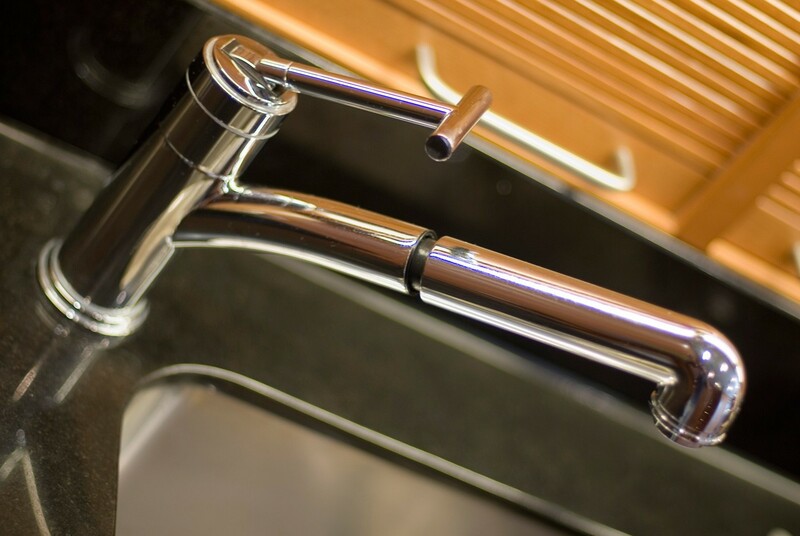 All staterooms have private ensuite bathroom facilities.